Cheek detail, originally uploaded by Zardoz67. Something a little different today before I drag you all kicking and screaming back to the landscapes. First, it’s a picture with an actual real-life person in it (my daughter) and second, it’s a picture that was not taken with the wide-angle lens (which has proved especially hard to put down since it cost so much). Many moons ago in my post ‘Nifty fifty’ which appeared somewhere right at the start of the blog I eulogised about the cheap Canon 50mm prime lens and how wonderful it was for portraits and getting great depth of field. Since then I have used it quite a lot for pictures of the family but I haven’t blogged a picture taken with this lens for some time. So here it is. 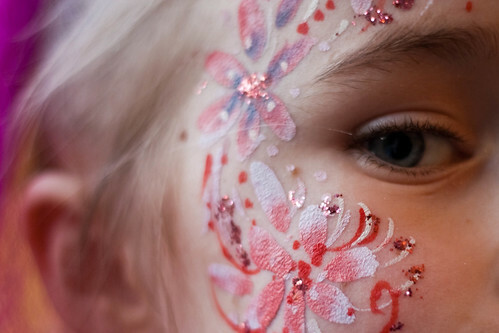 On Saturday my daughter went to her friend’s ‘makeover and pampering party’ and it appears to me that the life of your average 7-year-old girl is a never-ending whirl of parties and social engagements. On picking her up I was surprised to find that my daughter had been replaced with a seemingly older child with nail varnish, hair extensions and a rather interesting facial disfiguration. It’s also fair to say that she had gone for one of the more ‘subtle’ looks on offer. Of course, knowing full well that it would have to to be washed off come bath time, she asked me to photograph her new look for posterity. It is said by many, and to a certain extent I agree, that children, especially girls, grow up to early nowadays. Certainly, in our celebrity-obsessed culture they seem to be under increasing pressure to be slim, beautiful and able to sing and dance at a moments notice. You are expected to know about High School Musical, Hannah Montana/Miley Cyrus, Taylor Swift, Camp Rock (featuting that strange phenomenon known as The Jonas Brothers) or face being ostracised from your peer group. Thankfully, my daughter seems to be quite level-headed and sensible and has realised quite quickly that feigning interest can be just as acceptable (don’t tell anyone but she doesn’t actually like Miley Cyrus that much). She seems to have a huge group of friends and works hard to ensure that circle is maintained through choir, dance classes, musical instruments, gift and card giving, friendship bracelets, etc, etc. My son on the other hand has fewer friends but it appears that his friendships are closer. Not being any good at football has had an impact, but thankfully there are many kindred spirits who are as au fait with the world of X-Box, Doctor Who and trench warfare as he is. Maybe this is a basic difference between girls and boys and I have wasted many hours trying to figure out a certain dichotomy that exists in that my daughter, the social butterfly with a wide circle of friends, finds it a lot more difficult to interact with people she doesn’t know than my son who doesn’t think twice about walking up to an unfamiliar child and striking up a conversation/friendship. If, as a family, we’re on a beach my son will make a friend within minutes and be off playing cricket with some another family’s children, whilst my daughter will take hours to build up the confidence to join in. Of course the answer is that it’s just human nature; we are all at the mercy of our own genetic make ups and maybe first-born children have that period on their own when they have to strike-up friendships? Second-born children always have the lead of their elder sibling to follow, which can perhaps result in a lack of confidence. Of course the wearing of a mask or disguise can do wonders for your confidence and the little girl who came home from the party with a painted face & nails and purple hair extensions was a supremely confident individual. Unfortunately, it all washed off in the bath.